Sound Quality: 90% - Ken Kessler, Hi-Fi News, January 2012 Folk Singer has been an audiophile staple for years. It always gets a bunch of play at hi-fi shows. It's a no-doubter demonstration disc. But never before has it sounded like this! Never has it been cut at 45 RPM! 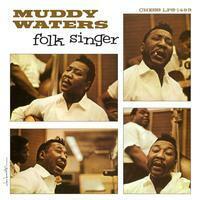 Muddy Waters' legendary 1964 Chess release Folk Singer is hands-down the most deliberated 'true audiophile' blues recording in existence. With outstanding support from Buddy Guy on second guitar, Otis Spann on piano, Willie Dixon at the upright bass, and contributions from drummer Clifton James, its reputation is not surprising, and the fact that Folk Singer stands as Waters' only acoustic album just adds to its significance in the blues canon. Greatest Blues Albums of All Time, Folk Singer is not just a great blues album but an audiophile standard, arguably the only "classic" blues record to achieve such a prestigious standing. Mastered from the original master tapes and pressed on 200 LP, with its grooves widened for 45RPM, this Chicago blues affair has never been better in any incarnation. Whether or not you already own this in a previous edition, consider Analogue Productions' new reissue an absolute must. Instead of re-issuing this yet again, some folks argue that Analogue Productions should reissue newer albums. They are tired of hearing again what they already have. What they forget is that the last reissue of this classic was many years ago. Sorry, but time flies, especially as you get older. And guess what else? That issue by Classic Records is long out of print as is the one Mobile Fidelity first issued around twenty years ago when the label decided to re-enter the vinyl market and press its own records in Sebastopol. The amount of inner detail released is simply astonishing. There are technical reasons for all of this having to do with how Quality Record Pressings was designed and built and how the presses were modified. Yet at the same time, the sound is sweet, liquid and free of harshness and edge. The dynamics are mind-boggling. When Muddy takes it up ten notches to emphasize a point it's positively explosive in a way the 33 1/3 version only suggests. So Muddy and Buddy and Willie have never sounded as natural and "in the room" as they do here. Combine that with stunning first rate gatefold packaging including session photos on the inside and this becomes the best ...Folk Singer ever. : Cut at 45 RPM For The First Time Ever! From the original 1964 Chess analog masters! Pressed at Quality Record Pressings! Mastered by Bernie Grundman. "Worried that the folk-music fad was luring listeners away from the blues, Chess Records directed Waters to record with acoustic instruments. These sessions — by Waters, Willie Dixon and a young Buddy Guy — went astonishingly well, and this pioneering "unplugged" set is beloved by blues and folk fans alike." — rollingstone.com ". ..This time, though, it's been given the royal treatment, and not just heavy vinyl. It has been remastered from the original tapes, It is a revelation...It's always been a chillingly 'real' experience. Now, it's overwhelming.